About twenty miles west of Topeka, Kansas, is the small rural town of Rossville. Founded in 1871, the farming community was home to a modest population at the end of the 19th century: 323 people in 1880 and 420 by 1890. 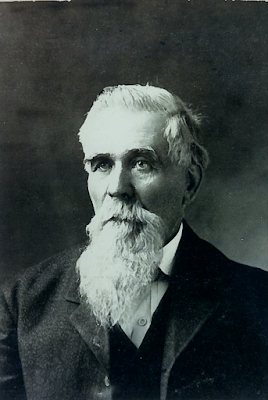 Among the town's early residents was William Lumpkins, my third great-grandfather. According to his obituary, William and his wife Phoebe Howerton moved to Kansas in 1868 from Kentucky and settled in Rossville in 1874. William was enumerated in federal and state censuses as a farmer. This occupation was corroborated in 1889, when he appeared in the local paper praising his insurance company's swift compensation following a lightning strike that set his barn ablaze. Rossville's surviving newspapers - recently digitized - revealed that William had an entrepreneurial streak and dabbled in a 15-month side hustle as a hotelier. William's business move was profiled in the December 18, 1891 issue of the The Rossville Times. "C.C. McPherson has sold the Gabbey House to Wm. Lumpkins, who expects to occupy it after the 1st of March. This hotel has been run by Mr. Gabbey for about six years. During that time it has been conducted in a highly commendable manner, and has afforded a home-like boarding place to those who year after year have made it their residence. We learn from Mr. Lumpkins that he intends to make things pleasant for his boarders, too." Early in the new year, on February 19, 1892, The Rossville Times shared William's plans for his new hotel. He would take up proprietorship after March 1st, and "contemplates conducting it in a way that will be satisfactory to those who are or may yet become permanent or transient boarders." 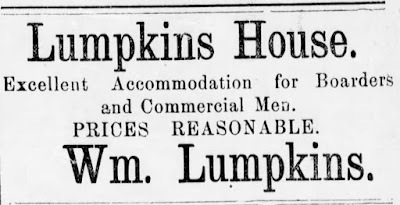 In the April 8, 1892 issue of The Rossville Times, an advertisement appeared for the newly opened Lumpkins House. The ad would ran regularly in the city paper, proudly proclaiming William's hotel as an "excellent accommodation for boarders and commercial men" with "prices reasonable." 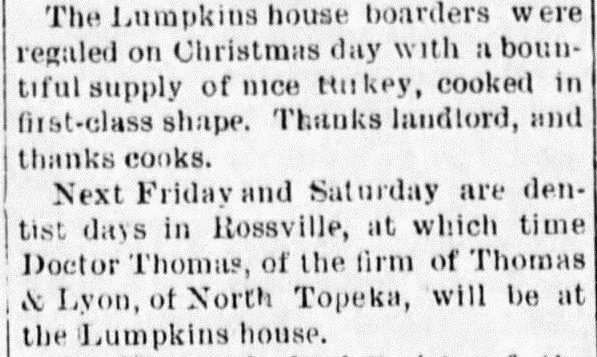 The Lumpkins House was truly a home away from home, offering "first-class butter and well-cooked fish" to its boarders. 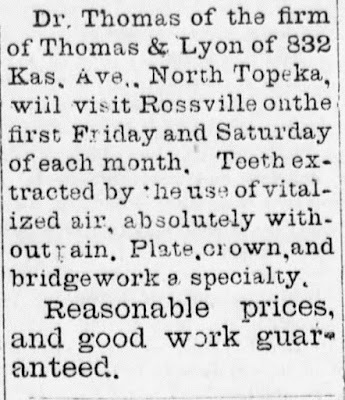 As the May 27, 1892 issue of The Rossville Times surmised, "No wonder that they look and feel happy." A month later, William's plans to add more guest rooms to his hotel appeared in the city paper. It was difficult, apparently, to "house all his transient guests." Or was it a salesman's ploy to make sure the community believed business was booming and the Lumpkins House was the place for out-of-towners to stay? William's hotel remained a fixture of Rossville's society pages throughout 1892. 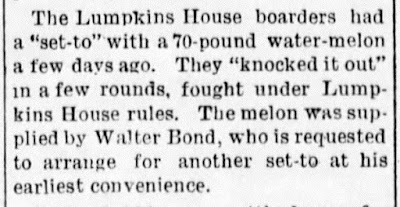 In September, the paper recounted that "The Lumpkins House boarders had a 'set-to' with a 70-pound water-melon a few days ago. They 'knocked it out' in a few rounds, fought under Lumpkins House rules. 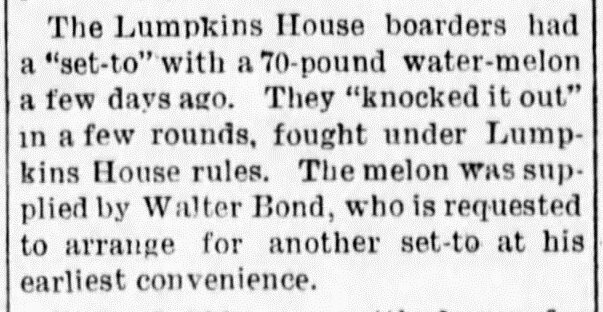 The melon was supplied by Walter Bond, who is requested to arrange for another set-to at his earliest convenience." 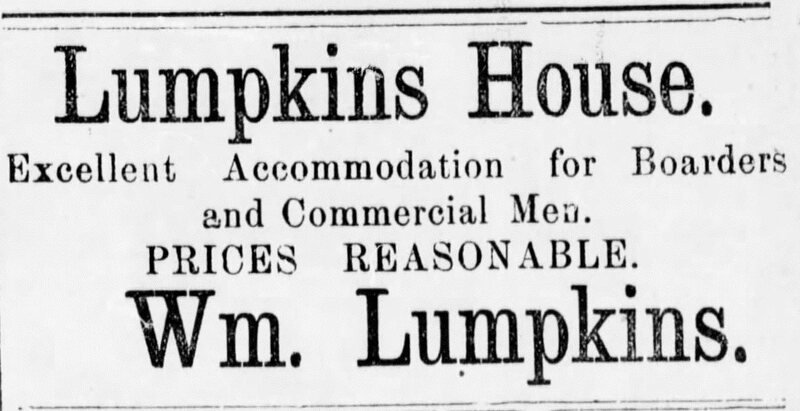 In November, a new town newspaper, The Weekly Critic, advertised that the Lumpkins House offered more than just sleeping accommodations. 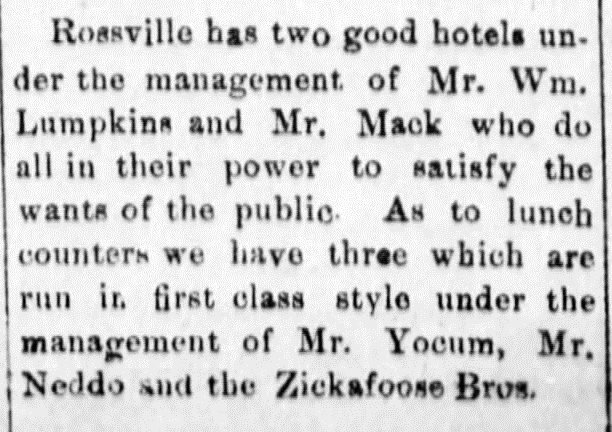 The following month, The Weekly Critic ran a new advertisement for the Lumpkins House, promoting it as the "only hotel in Rossville" and highlighting its "special rates to travelling men." 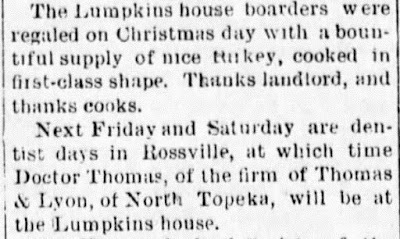 In late December, the Lumpkins House boarders spent Christmas feasting on turkey "cooked in first-class shape" and the Rossville community was reminded that "Next Friday and Saturday are dentist days in Rossville, at which time Doctor Thomas, of the firm of Thomas & Lyon, of North Topeka, will be at the Lumpkins house." 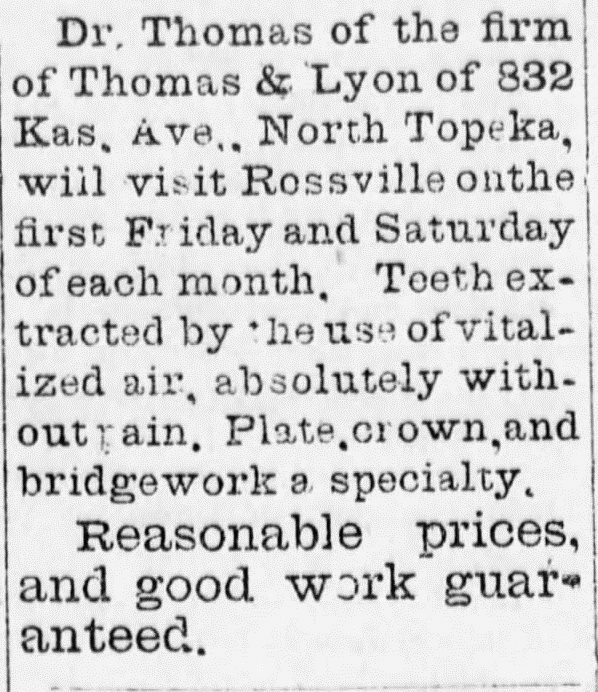 Fortunately, for the townsfolk, Dr. Thomas was well versed in the latest dental sciences, including the ability to extract teeth "by the use of vitalized air, absolutely without pain." The dentist and his vitalized air must have been a hard act to follow, but somehow William managed to book the illustrious Professor Pickett of Indiana who was a "well known lecturer on Human life..."
Professor Pickett checked into the Lumpkins House with "ten pieces of baggage (weighing nearly a ton) in which are Skeletons, Manikins, Skulls, Paintings, Plates, Diagrams, Batteries, Atomizers, Instruments, Microscopes, tests, drugs and medicines." Suddenly, Rossville's business landscape changed. In late January 1893, there was competition in the hotel industry. The Lumpkins House was no longer the only hotel in town. 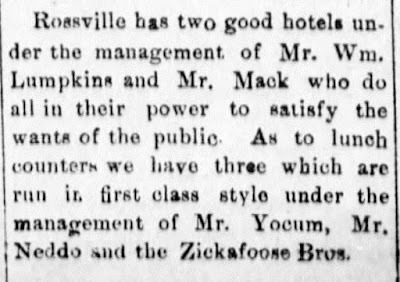 Rossville now had "two good hotels under the management of Mr. Wm. Lumpkins and Mr. Mack who do all in their power to satisfy the wants of the public." In a town of just over 400 residents, the competition struck a fatal blow. In March 1893, C.C. 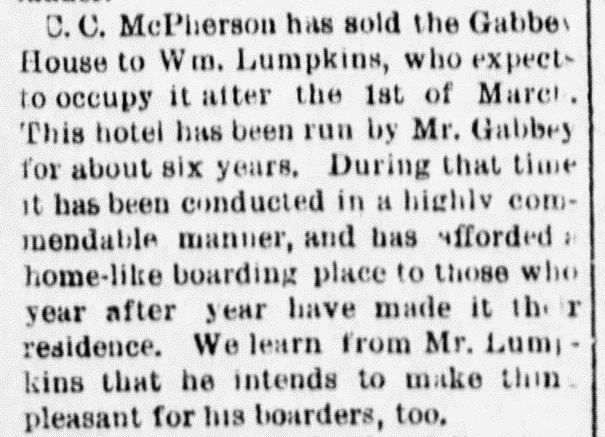 McPherson bought the Lumpkins House back - just 15 months after he sold it to William. 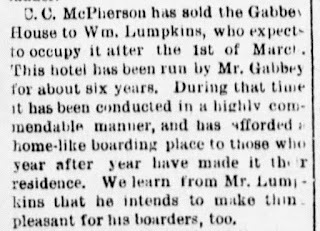 In that same issue of the newspaper - on that same page, in fact - we learn that William Lumpkins was "prospecting in New Mexico..." He was clearly out of the hotel business and out of town. While many businesses fail, I'm sure that was little consolation to the businessman who invested hard-earned capital, time, and sweat equity into the venture. Perhaps it was some consolation to William that C.C. McPherson ended up selling the hotel one year later in March 1894. As a family historian, I knew only generally that William had been the proprietor of a hotel. Prior research had turned up one of his advertisements. However, the power of digitized newspapers and Optical Character Recognition (OCR) have made it possible to fully capture the story of his 15-month business venture. This is a remarkable feat and underscores the incredible role technology plays in bringing the past to life. In the span of a weekend spent reading keyword searchable newspapers, I was able to experience some of William's life as it unfolded, and make the man pictured in black and white seem more accessible. How awesome to find all those ads & mentions! It's a wonderful thing when a newspaper you need can be found digitized online. There are so many I would love to see - I can only hope. I'm getting some things for collateral lines, still would like to find more on my direct lines. It'll happen, and the newspapers for Rossville are a case in point. These papers were not digitized just a few years ago and I was liaising with the local library to find obituaries. Now that they're digitized and keyword searchable, I'm learning more about my ancestors' livelihoods. Digitized papers are the next big frontier for family historians. We live in a remarkable world of technology. I don't want to imagine how much time this would take to research if you had to go to the library and look through stacks and stacks of old newspapers. Interesting man, your William. Years! It would have taken me years! :) I don't even think I would have thought to page through the paper for this information. His hotelier career was an unexpected but very welcome find that gave me new insight into William's livelihood. I also love the newspaper databases. Without them I'd know far less about the people behind the names and dates. I hope William went on to more successful ventures! They've really been eye-opening, and I'm a huge advocate for digitizing all papers. Imagine the things family historians would more easily learn! As I read the newspaper clippings in chronological order, I feel like I'm fast-forwarding through his life. It seems his hotel was his last entrepreneurial endeavor and he quietly retired.